Some of you will see where this is going from the title of this post. Backing up: I am in the middle of this family Experiment in Multi-Generational Living out here in California (you go "out" west and "back" east, btw. Must be a holdover from pioneer/Manifest Destiny triumphalism. Native-American friends just shake their heads). One of my assignments is to have fun two afternoons a week with Kevin, the five-year-old grandson, to break up his long Kindergarten day. 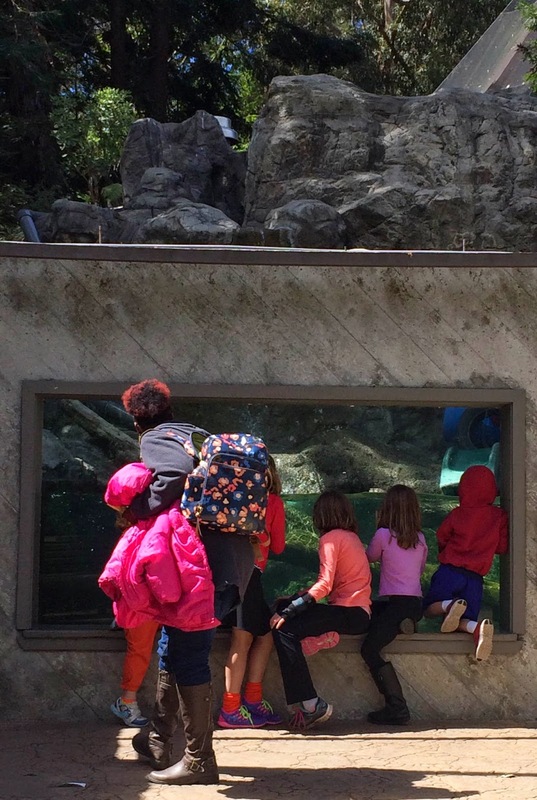 Last week we went to CuriOdyssey, a science and wildlife center for kids south of San Francisco. I wanted to take Kevin there because it had otters and there are few things more fun than watching otters play in the water. And that's what you see in the picture above: a bunch of kids (Kevin on the far right) and one adult, mesmerized as they watch two otters jump, slither, push themselves off the glass to zoom and twist faster. Pure joy in the water. There were lots of other animals at the center, too -- quick foxes, lots of birds, big turtles, a slow, shy badger, snakes, a plump toad -- over 100 mammals, birds, reptiles, amphibians and invertebrates. Kevin gazed at them all, but the otters transfixed him. I also wanted him to see the otters because shortly before this excursion we had started reading The Wind in the Willows, that magical book about a community of wild animals in the English countryside messing about with boats in the river, getting into trouble with "motorcars" but always staunchly helping each other as friends. Best friends forever. It is the best kind of moral book. I had given the book to Kevin at Christmas, a little pocket-size edition with a dark red satin ribbon to mark your place, like a prayer book. Kevin loves opening the book and carefully taking out the ribbon to start reading and then putting it back into the pages when we stop for the night. He never wants to stop, which at first surprised me. The book was published in 1908. The language is ornate and archaic. He can't understand many of the words. 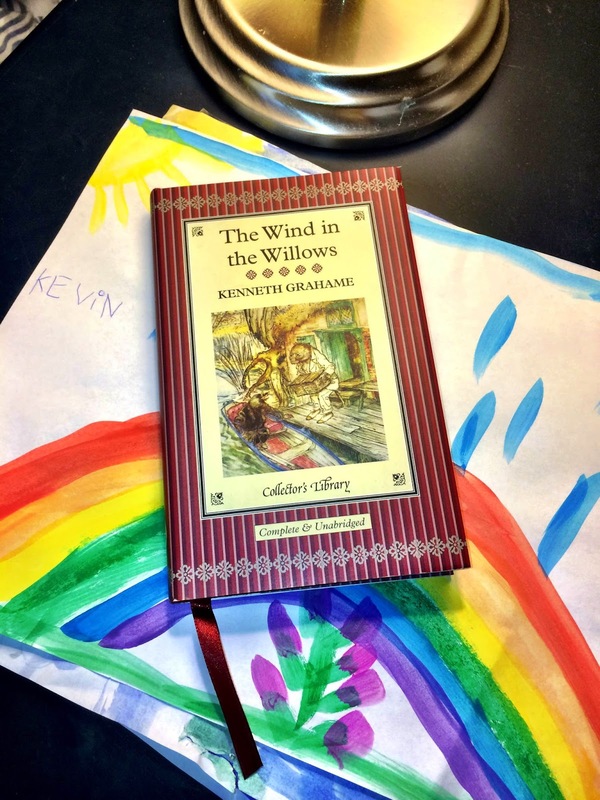 But he hears the cadence and, no doubt, my love of the book in my voice. He follows the plot regardless. He keeps track. We spent a long time that day at CuriOdyssey, especially at the Otter Place. As we drove back home, Kevin was quiet, looking out the window. Then he said: "You know, Mae-Mae, we saw otters, a toad and a badger." I held my breath, waiting. "Just like The Wind in the Willows!" he said. I looked in the rear view mirror and saw the quiet, secret smile of an initiate. He gets that book and I hope he always does. Instant Gratification: "Never in his life had he seen a river before..."